12.3 – By a signboard, cross the paved road and quickly turn L to reenter woods. 12.5 – Cross a creek bed on a small footbridge. 5-A: If you look uphill toward the paved road, you will see a brown structure. This is a well house for a community water system well. Groundwater is stored and moves slowly within cracks in the bedrock. Water leaves the groundwater system by feeding streams and lakes, in addition to being withdrawn in wells for human use; groundwater is replenished by infiltration through the soil following rainfall. In North Carolina, about 40% of the residences rely on well water. Restrictions on development in the watershed of Falls Lake help to protect groundwater quality in this area. 5-B: As the trail goes uphill, you may notice a small block of strongly banded gneiss on the trail. The appearance of these bands led to the name “zebra gneiss” for this rock type in the Wake County area, and it is thought that it is an unusual variety of mylonite, indicating the existence of an ancient fault zone. 12.7 – Cross a short plank walkway to reenter state gamelands. 5-C: Toward the right (northwest), you will notice nice views of a narrow arm of Falls Lake. This is the valley of Lower Barton Creek. It also marks the trace of the Falls Lake fault, which separates the Crabtree terrane, on which you are standing, from the Falls Lake terrane on the other side. Section 6 of the trail lies within the Falls Lake terrane across the fault. Between here and the next footbridge, you will encounter several blocks, slabs, and outcrops of Crabtree terrane felsic gneiss, some orange in color, and much of it containing disc-shaped quartz producing a nubbly appearance. This rock is generally granitic in composition. Just before arriving at the next bridge, there is an outcrop that has been completely overgrown by a big tree. 12.9 – Cross a creek bed on a footbridge. 13.1 – By the lake, cross a small creek on a footbridge. 5-D: Just below the bridge, there is an excellent outcrop of very light-colored (leucocratic) felsic ribbon gneiss. The fin-like rocks strike north-northeast and dip to the west steeply – about 75°, creating a series of cascades along the creek. Look closely at the rock and you will see thin alternating bands of various light-colored minerals. The individual bands tend to pinch and swell; they indicate that the original texture of this rock has been completely modified as a result of shearing within a fault zone. Originally a variety of granite, the rock is now mylonitic gneiss. 13.4 – Cross another small creek on a footbridge. 5-E: Another stretch of cascades along this creek, showing extensive exposures of more deformed felsic gneiss. Though locally showing a ribbon texture, the pink to orange gneiss here does not show a strong mylonitic fabric as at the previous outcrop. If you walk downstream from the bridge you will see an excellent example of joints in the rock exposure (Figure 5-E). Notice that the main foliation of the rock, which gives it its fin-like appearance, strikes north-northeast and dips steeply to the west, as before. However, there are also some planar fractures that cut across the foliation at a high angle. This joint set (group of fractures with a consistent orientation) strikes north-northwest and dips very steeply (about 80°) toward the south. Such joints are formed under brittle conditions, after the main (ductile) deformation and metamorphism. These brittle conditions are reached as the body of rock is cooling and being unroofed by the uplift of the region and erosion of the overlying material. In the Piedmont, such joints are particularly important as pathways for the movement of groundwater. 13.6 mi – Walk up a rock-lined drainage to reach Six Forks Rd. Turn R to walk across the causeway. 5-F: As you walk along Six Fords Road over the causeway, you pass across Lower Barton Creek and the trace of the Falls Lake fault. You start in rocks of the Crabtree terrane, which dip beneath rocks of the overlying Falls Lake terrane. 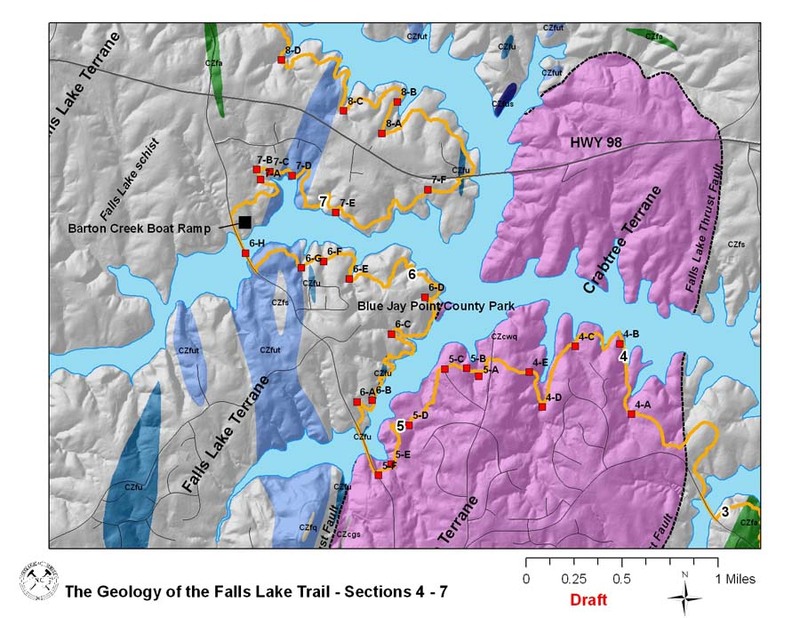 Section 6 of the trail is entirely within the Falls Lake terrane (as are Sections 7, 8, and 9). Looking to your left, you should be able to see generously named Adam Mountain (elev. 478 feet). The fault passes along a small creek that runs just to the left (southeast) of Adam Mountain. An old soapstone quarry lies just to the north of Adam Mountain.